Just because you’re having a crappy day doesn’t give you the right to take it out on anybody else. Keep your mood to yourself and if it helps to isolate yourself from others, then do it. I keep to myself whenever I’m in a mood and I’ve worked in the same company long enough that I’m left alone whenever I need that space. Sometimes just getting out and having some fresh air and sunlight is exactly what you need. If it is possibly for you to go take a walk outside, DO IT. I remember once having a day so horrible that I was close to crying. I took a walk to the nearby garage during my break and returned to work feeling a million times better. Sometimes opening up to a friend as to why you’re feeling the way you are, can help you feel better. Just be careful not to be disrespectful about co-workers, management or the company. Go shopping, eat your favourite meal, listen to upbeat music. Do something that you know will make you feel better immediately. I don’t know about you but I feel like social media is the one place I can feel free to just be myself. Which is why I avoid it when I know I’m upset or angry. Don’t let your single bad day at work be broadcast to your 500+ friends and followers. What do you do when you’re having a bad day at work? Let me know below. I’m writing this at 7PM on a Saturday. I worked today and I am totally and utterly exhausted. I was watching a video on Youtube where one of the lifetstyle vloggers spoke about her internship experience. She mentioned not enjoying the office environment and found it crazy that she had to wake up at 7:30 each morning (I wake up at 5:30. I’m very jealous). I feel like there’s a huge difference between the college life and the working world. Most of the time, graduates are not prepared. So here are some of the things I think college graduates need to know about their first job. This may not be the job for you- Guys, this is SO SO SO important. Sometimes your first job may not be for you. I had a friend join a company where she was utterly miserable and could not hide it. She would do the bare minimum of work to get by simply because it was not what she wanted to do. Not every job is for every person and I don’t think lots for people realise that. You may not have your dream job- Similarly your first job may not be the job you wanted. I spent four months looking for jobs in Media and Publishing before giving it and taking the first job I got. Was it in the field I wanted? No. Did I learn from it? HELL YES! There will be a transition period for you- Adjusting from the world of skipping classes just coz you could to a workplace where you need to be in is a HUGE adjustment. I’ve been working for ten months and it still makes me sad that I can’t just skip work on Fridays and stay in bed. Damn you, Uni for spoiling me. It is not always pretty or fair- Such is life. Guys, I can’t even tell you how many times I have been left gaping at the sheer unfairness of life especially in the working world. There’s lying, back-stabbing, betrayal. Think about a Housewives reality show and you have a good idea. WATCH YOUR BACK! You probably won’t have the salary you want- Starting salaries are incredibly low. I also feel like Durban salaries are especially pathetic. Please can someone explain to me how to survive on R2000-R3000. Have you heard of a little expensive thing called petrol? Your degree probably won’t count for much- It is very rare to find a job in your field especially if, like me, you studied something in Humanities (also, can I please point out that Humanities is the biggest college in my university and yet they do nothing for the students to find a job? Yes, I am still pissed about that. You’ll soon see why). At the beginning of your job hunt, your degree might not make much of a difference in your career. I had a friend (non-Humanities of course) who worked for three years after university before he finally got a job in his field. I was equally parts impressed and jealous. It’s not what you know- Following from the above point, it’s more about who you know that what you know. The wonderful job where I learnt so much? My aunt recommended me for the position. While I am grateful to her, it annoys me that my degree was so useless. Why did I waste three years studying when I could have just had someone recommend me for a job. That being said, NETWORK! It is a great way to make connections and you never know where your next opportunity will come from. 1) Rule of thumb: If you wouldn’t want your gran to see it, don’t put it up. This rule works great for me since I do actually have my grandmother on Facebook. This rule has served me well in social media…mainly because as a teen, I was always getting in trouble for posting something or the other that people deemed offensive. 2) Set your profiles on private: I think this is a great rule since you have some sort of control over who views your profile. Facebook, Twitter and Instagram all have settings that protect your privacy. However if you work in a field like social media or marketing, doing this may be like shooting yourself in the foot. My Facebook can only be viewed by friends while my Twitter and Instagram are open to the world since I use those accounts for blogging. 3) Google yourself: Googling a person online is the fastest way to learn more about them. Google your name and see what comes up. If there’s anything that could be considered as rude, unprofessional or portrays an image that you don’t want, get rid of it. 4) Delete past posts: Delete posts that are rude, mean or just have a negative air about them. Untag yourself from pictures of alcohol, drugs, that picture of you in the bikini, etc. You don’t want to be seen as a party girl by potential employers (even if that is who you are). 5) Ask a third party to double-check: Get someone you trust to do a Google search on you and evaluate the results as well as checking your social media. Having someone else look through your stuff lets you see how others may view your online presence. While the popularity of social media has killed the concept of privacy, using the tips above can help you use this lack of privacy to your advantage. Wallet (with cash in it)- I never go anywhere without my wallet mainly because my wallet contains my driver’s license. However, I have, on occasion, gone out with an empty wallet. Apparently not all the stores take cards (but they really should). Pen and notebook- You never know when you will need a pen or piece of paper. Especially in the workplace. Don’t be that person that has to borrow from someone else. Glue- So you don’t have any shoe issues like I did. Safety pins- To help protect you from any other wardrobe mishaps. Pain tablets- I always carry pain tablets because I always seem to have a tension headache. It is also helpful if a co-worker has a headache and you have Panado in your bag (I say Panado because I have yet to hear of any harmful side effects. Please don’t share any tablets that may have side effects). Toiletries- As a female, it is always a good idea to have toiletries in your bag if you or a co-worker may need them. Tissues/Wet wipes- I just found wet wipes in a store recently and I absolutely love them. I carry both wet wipes and tissues with me. The wet wipes are for when I need to wipe my keyboard or desk and the tissues are for soaking up spills. What are your handbag essentials for work? Do you have any suggestions that I must have missed out? Let me know below! Check out the location of your interview the day before- My first job interview was at a place that was really difficult to find. However I made my dad take me to the venue the day before so I would know how to get there and how long the drive would take. When I went in for the interview, the manager was super-impressed that I found the place without any trouble and that I was early. Especially when I explained to him that I had visited the location the day before so that I wouldn’t get lost. Print out multiple copies of your CV/Resume- Print out atleast five copies of your relevant documentation in case your interview is conducted by more than one person. I did this just because I read this advice somewhere online. I never thought I would actually need it until I went for an interview that was conducted by two managers. They each had a copy of my CV and the receptionist took one for their records. It’s better to have extras just in case. Leave home early- You certainly don’t want to be late for an interview. It reflects very poorly on you no matter what the circumstances were. Make sure you leave home early enough to get to the interview on time. Learn everything you can about the company and the position that you’re applying- I always like to distract myself during interviews by making friends with the other interviewees. I met a girl once who had no idea what the position we were applying for was (it was debt collecting) and when this was revealed in the interview, she was sent home. Ensure that your outfit is professional- Dressing professionally shows that you are serious about the job. First impressions matter and when it comes to an interview, it might be the only impression that you make. What are your tips for handling job interviews? I’d love to know below. I posted this before but I’m sharing again for anyone who needs cover letter help for the new year. 1) Personalize your letter for each application- even if you’re applying for the same position at different companies, it is important that your cover letter is tailored for each company. For example, your application for a fashion magazine and a newspaper should each mention what you could bring to the specific company and position. 2) Try to stand out- Standard introductions are boring. 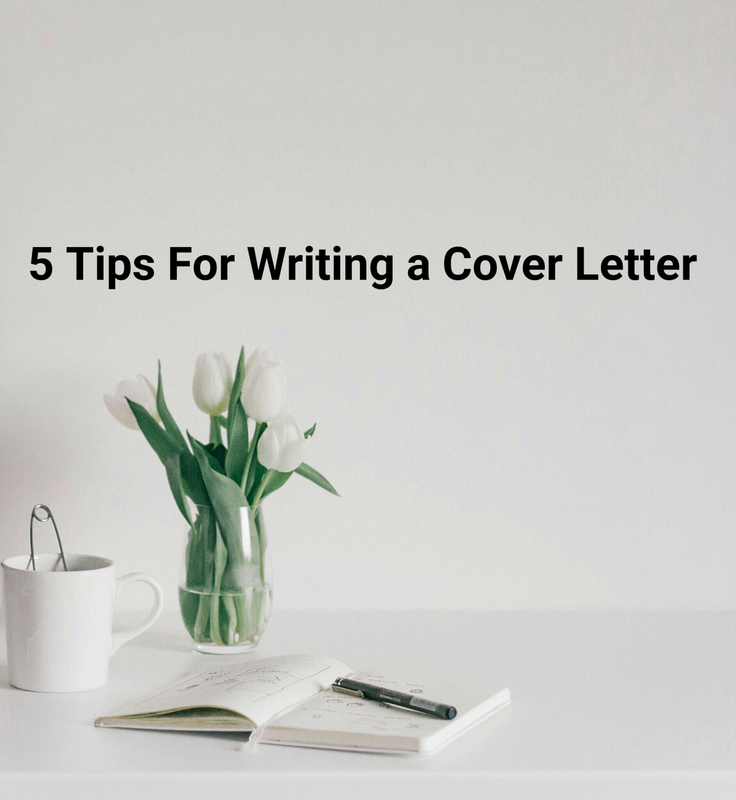 Remember that the person reading your letter goes through several other cover letters as well. Try to stand out in your letter to get their attention. For example, instead of starting with “my name is x and I am applying for y”, start with something out of the box like a quote or motto that you believe in. 3) Do not write an essay- a cover letter that is succinct is more successful that a three – page – essay. Ideally a cover letter should say who you are, what you can bring to the table and briefly list your experience or qualifications for the job. 4) Show what you can bring to the job- I’ve stated this before. This is just to emphasis it. The company has hundreds of applicants. Obviously everyone wants the job. Obviously they have something to offer. But what do you have? Stellar social media skills? Writing experience? Show that you stand out from others with your unique skills. 5) Stick to the format- a cover letter is just that a letter. So stick to the usual format of a letter. Don’t know the format? Google it! And remember to ensure that you have no typos. Nothing spells unprofessional easier than a badly-formatted, typo – riddled cover letter. 1) For the experience: Personally I feel the experience gained from an internship is priceless. (This is obviously because I’m not paying for gas or any kind of bills but anyway). 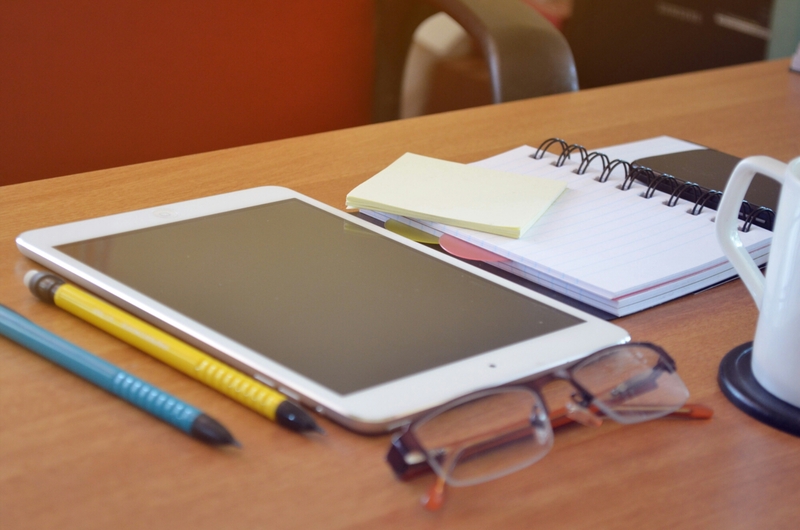 Internships can teach you so much that you never thought you needed to learn. 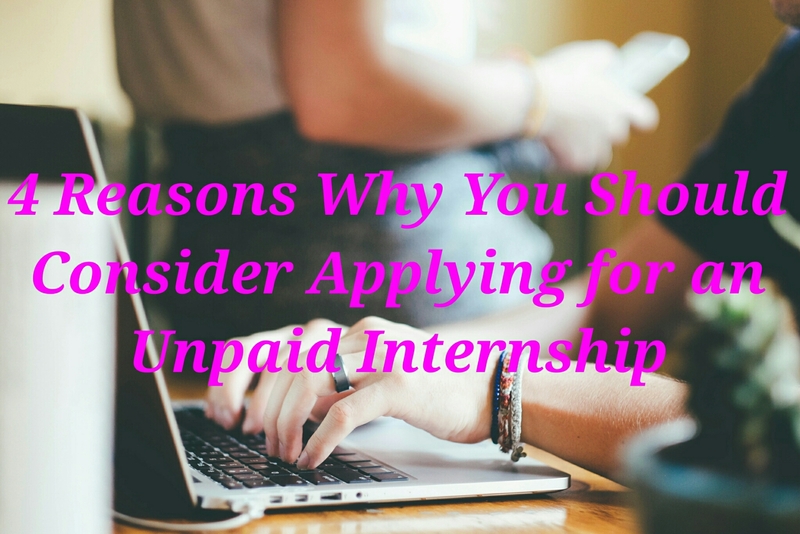 Whether paid or unpaid, experience learned from an internship is ALWAYS valuable. 2) To gain networking contacts: An internship is a great way to make networking contacts for the future. You never know if a person knows someone who may be able to help you in the future. 3) To expand your knowledge of the field: You can learn alot from an internship. For example, when I interned at a local magazine I learnt how magazines worked as well as websites and social media. There’s no predicting how much you may learn in an internship or when you will use this knowledge. 4) To decide whether or not you want to go into that specific field: Interning allows you to see if a certain industry is a good fit for you or not. Taking an active role in the industry is a great way to find out whether or not you want to be a part of it in the future. Interning without being paid for it may not be your first choice but it has tons of perks that shouldn’t be ignored.